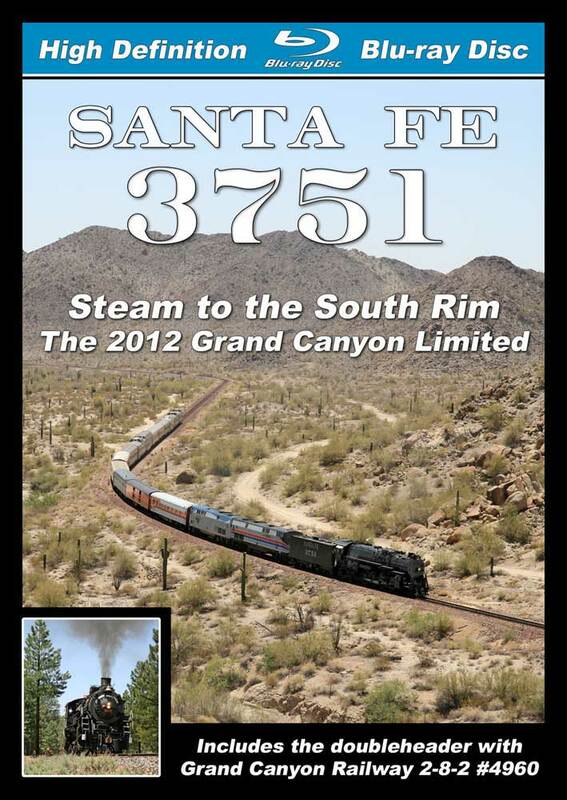 As part of the 2012 Arizona Centennial celebration, Santa Fe 4-8-4 #3751 pulled a special train from Los Angeles, CA to Williams, AZ in mid-May. Once in Williams, #3751 doubleheaded with Grand Canyon Railway 2-8-2 #4960 on a roundtrip excursion to the south rim of the Grand Canyon, before pulling her train back to California. This program covers all five days of operation on the "Grand Canyon Limited." 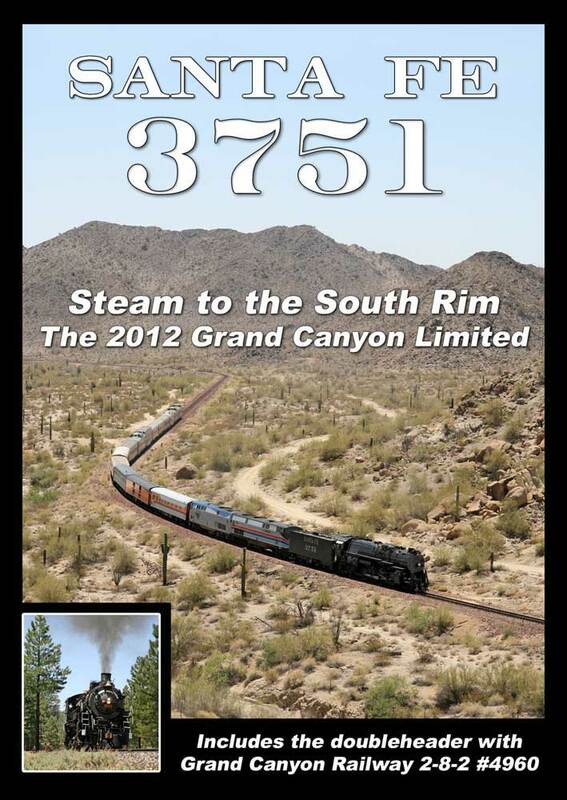 This was the most anticipated steam event of 2012, as #3751 left southern California for the first time in many years, and traveled to the Grand Canyon for only the second time ever. In this program, you'll see #3751 in a variety of trackside locations, with plenty of runbys in addition to footage of the many servicing stops. Highlights include: #3751 battling the grades of Cajon Pass, high speed running through the desert on the BNSF transcon mainline, and of course the Grand Canyon doubleheader. You'll see #3751 on the scenic 'Peavine' line with a backdrop of impressive mountains, plus the massive Hell Canyon Bridge at Drake. Filmed entirely in HD, witness #3751 in stunning detail as she travels over 1300 miles through beautiful western scenery. Stark desert landscapes are contrasted with towering mountains as the train travels through the Mojave and Sonoran deserts. This program has minimal narration (with the option to turn it on or off) and no distracting music. This is a standard definition DVD-R presented in 16:9 widescreen, and should be compatible with any DVD player. Total running time is 85 minutes. This producer uses standard DVD cases for their BLU-RAY products instead of the shorter blue-tinted Blu-ray case normally used on Blu-ray products. chris collins (fletcher north carolina) on 2018-07-18 21:34:18.